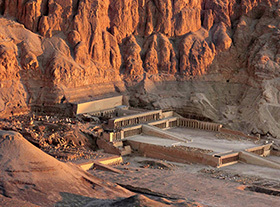 Thutmose III’s mortuary temple was built next to that of his stepmother and co-pharaoh, Hatshepsut. It was dedicated to Amun. Hatshepsut’s magnificent temple includes a shrine to Amun, as well as chapels for Anubis and Hathor. The walls show scenes from Hatshepsut’s famous expedition into Punt (modern Somalia) and the so-called “Birth Colonnade” which describes the story of Hatshepsut’s divine birth – a story she used to legitimize her rule. The temple was designed by Senenmut and includes a series of terraced colonnades set near a sheer cliff face. Later pharaohs destroyed all images of Hatshepsut in the temple, as well as her other monuments, yet it remains one of the most enduring and beautiful ancient sites in Egypt.